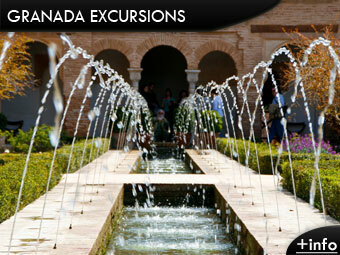 Granada is a city with a rich monumental and cultural heritage in Andalusia. In Granada we can enjoy not only the Alhambra but its streets and its people, its Tapas and, if we go in winter, the Sierra Nevada. Getting to Granada from Malaga is easy if we have our own vehicle; in around 1 ½ hours we will have arrived, thus we recommend renting a car at Malaga airport if you are licensed to drive. The price of the trip to Granada is 58 € and its duration is 1 day, with weekly departures from Malaga Tuesdays, Wednesdays and Fridays throughout the year, except for Wednesday which is only during the summer season. Among many other things is included a visit and tickets to visit the Alhambra, the Palace of Charles V and the Generalife gardens. Stops are made along the way for breakfast and optional lunch in the city centre of Granada. Of course it includes travel insurance, air conditioning or heating in a luxury bus and a guide who speaks several languages, so that you know every detail of the visit. Take in consideration the season you are coming and bring clothes according to that, warm clothes during the winter and light clothes in summer. You may also need sun protection. Take in consideration you might walk and stroll the city so comfortable shoes and clothing is more than recommended. Car rental in Malaga: Very good option if you have a driver's license, so you can enjoy all the way and make the stops and breaks as and when needed. Transfer Malaga airport to Granada: For you, your family or a group of people. Check prices and different options from Malaga airport.